Towing: A roadside technician will tow your vehicle, at no charge, to either Fredericton Volkswagen or the nearest authorized dealership. Boosts: If you can’t safely start your vehicle, a towing service will be offered at no charge. Flat tire changes: A roadside technician will replace your flat and have you back on the road. Unlocking your door: If you lock your keys inside your car, a roadside technician will give you a hand. Run out of gas? Emergency fuel can be delivered free of charge. Emergency winching service: We’ll cover the costs of getting you out of the mud, sand, snow or a ditch. Trip interruption benefits**: If you choose the Assurance Premium Program, and your vehicle experiences a mechanical breakdown more than 160 km from your home, you could receive up to $300 per incident, taxes and any additional fees included. For how long is roadside assistance valid? Volkswagen’s 24-hour roadside assistance* is valid for 6 months with the Volkswagen Assurance Program, and for 2 years or 40,000 km (whichever occurs first) with the Volkswagen Assurance Premium Program. 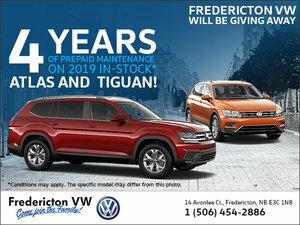 For more information, contact us today at Fredericton Volkswagen!